Sierra Forest Road #11S12 - Paved road access up the granite canyon (from Pine Flat Reservoir). Steepness, sheer cliffs and small roadways makes this driving route a hairy drive - One lane wooden bridges. Overall, narrow single lane paved road from south side. Dirt Roads access this area from the north (Wishon Reservoir) & nice waterfall view on the way down. This partially paved back road is not for the timid drivers. The lake is a totally bitchin, mid Sierra location for a true weekend away - way away. Best camping months May-October. 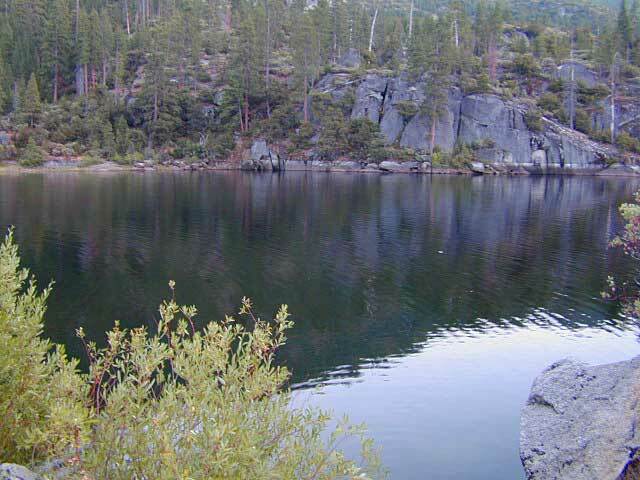 Sierra storms hit this 4000' elevation lake - mostly in winter months. Seclusion & fishing are the big draw here. 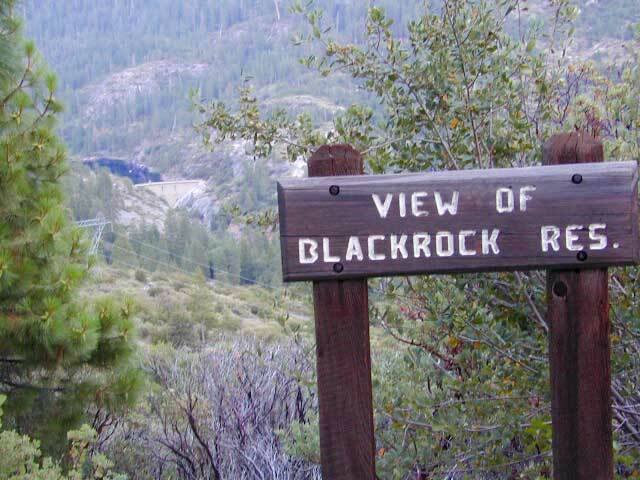 Blackrock Campground is a small & way outta the way. RVs are not allowed back here, due to steep winding, one lane road - along deadly granite cliff. No reservations. Campground on a first come basis. 10 campsites. Vault toilet, picnic tables and campfire rings. 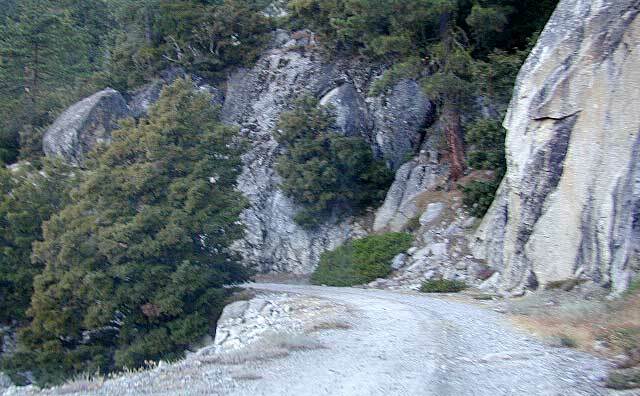 BIG DAY TRIPS: Pine forest, oaks, waterfalls, granite cliffs and best location, as the dirt roads lead higher into the Sierra Nevada granite beauty and dense forest. Dinkey Lakes, Wishon, Courtright - just to name a few. Plus there is a Sequoia Grove up above too! This particular small lake campground is a long drive no matter which way you come from. Driving the curvy, one lane, shoreline of Pine Flat Reservoir seems to take hours. or the infamous 'Black Rock City' which is on a dry lake bed; North of RENO, NV - part of the whole BurningMan ordeal. 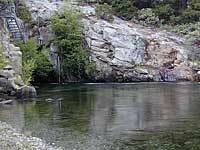 This body of water in a dark granite gorge can be a fisherman's dream spot. Easy access to the big, wide Kings River below & Pine Flat Reservoir below that, this ideal mid point called Black Rock will be secluded for any dreary city-dweller. Driving in for the first time should be done during day light hours, since the narrow road is steep, narrow, one lane and dangerous. 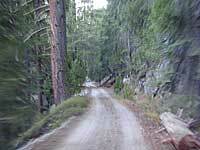 Upper streams, waterfalls and lakes further up the mountain via dirt back roads, another 2000-3000' elevation gain. Well worth a day trip or two. You'll need a good forest road map to explore past this point too. Plenty primitive camping all along these forest roads, way back up in this canyon of the North Fork of the Kings River. SIERRA National Forest. 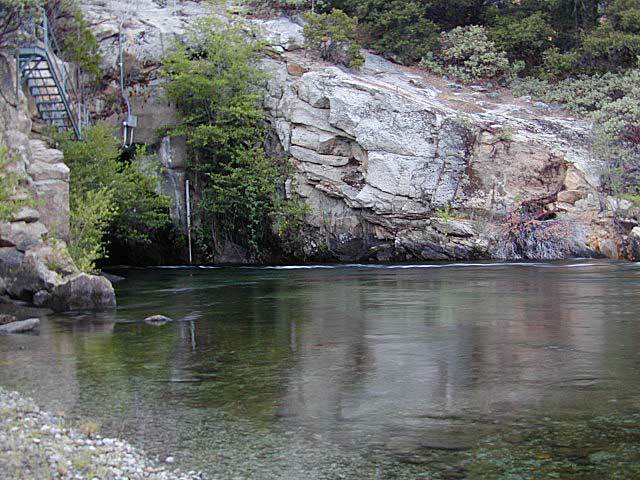 Sawmill Flat Campground is further up Black Rock Road - rocky, rugged w/ granite cliffs, forest road #11S12. Mountain peaks tower at 7000' w/ winter snow falling usually Nov-May. This backroad is often gated & locked, so call ahead to the ranger and ask.